We move more safes than any company in Tennessee. Let us put our 17 years of Safe and Lock experience to work for you. Searching for the right safe is sometimes a difficult task. Our goal at The Safe House is to answer your questions in an honest and clear way that cuts through all of the hype of other sources. With our exclusive Safe House Vault Door we provide your family with vault like protection during a storm. Our storm shelters meet or exceed FEMA 320 standards. Watch our videos on what to look for when purchasing a safe. When buying a safe it is very important to understand the differences between the safes, and the UL rating. 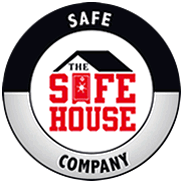 The Safe House offers these instructional documents to assist customers with changing the combination on assorted mechanical and electronic locks. What kind of Safe is best for you? Read about our storm shelters and saferooms. Do I need a bank safety deposit box? What kind of safe is right for me? Does it matter where I buy my safe? Knoxville Safe House is Open to serve you. ©2013 The Safe House. All Rights Reserved.